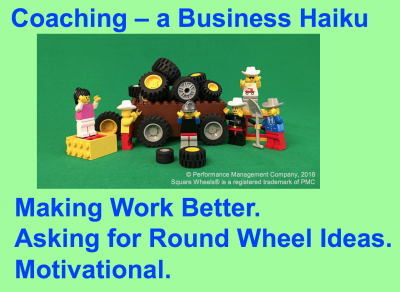 I’m going to be completing a complete redo of our Coaching Tools toolkit soon, one that embeds a series of our LEGO® Square Wheels® scenes and themes. So, I thought to warm up my brain and do an illustrated business haiku, just for you. The basic idea of the image is that people find the implementation of new and better ideas to be motivational, once they get past the struggles of actually implementing the improvement. The latter comes with the initial perception that something might be improved (Square Wheels®) with the stopping of the act of pushing and pulling, allowing people to step back from the wagon to see possibilities. With the support of The Boss Wagon Puller, maybe they can try to do things differently. Motivation comes from the active ownership and active involvement for workplace improvement. Asking for Round Wheel Ideas.